Child care, education, games, safety Childcare: Game : Throw the dice! Game : Throw the dice! -I throw the dice! Look what the number is on the top! Clap your hands as many times as much dot you see. 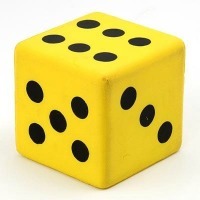 Take care, if you see only one dot on the top of a dice, don't clap just turn around. The children who is the closest to the dice will throw next. The game force children to listen carefully, to count and act! It makes them successful, and happy.